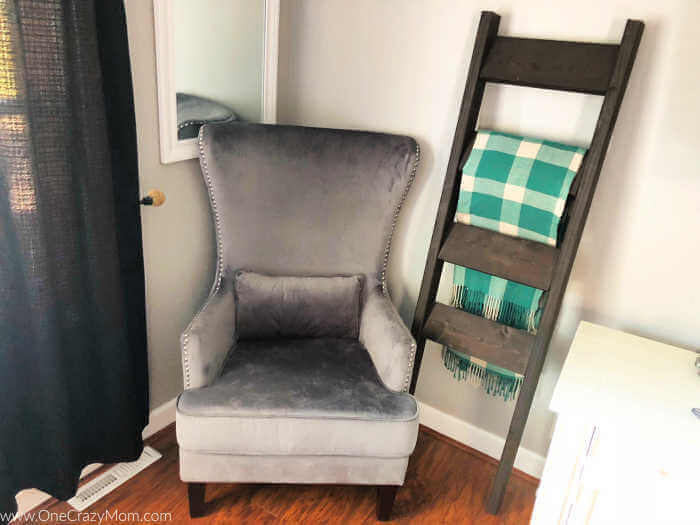 Learn how to make a DIY Blanket Ladder for a fraction of the cost of store bought. 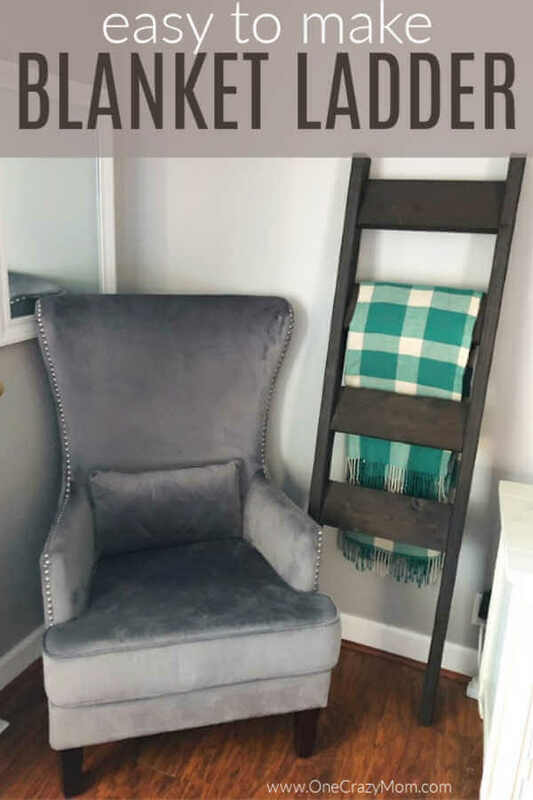 This ladder is super easy and so pretty to display throw blankets in your home. Have you had your eyes on one of those pretty blanket ladders? Well, we have a very simple tutorial to make one that is rustic and gorgeous without the hefty price tag. 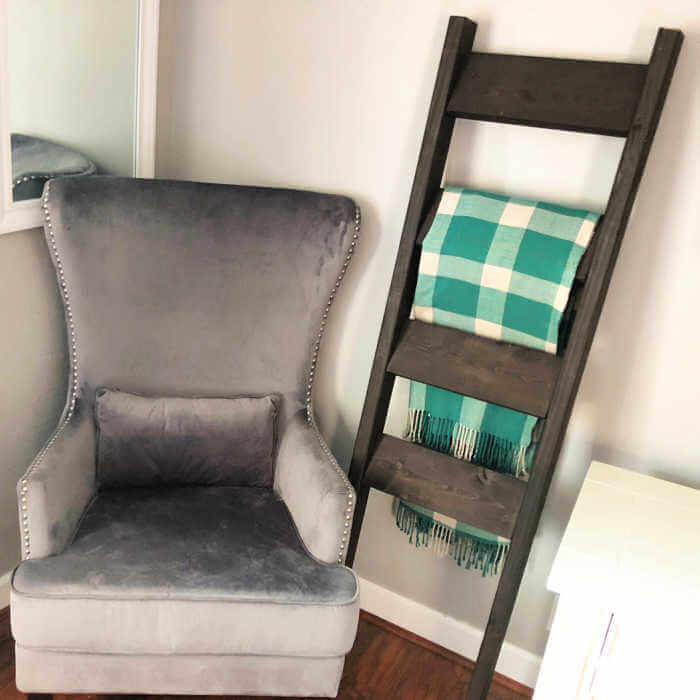 This farmhouse blanket ladder DIY is so easy that you might just end up making a few for gifts as well. These ladders are such a fun way to organize and display your blankets. I love to switch the blankets out for seasons and it looks so festive and pretty hanging on the ladder. It is such a simple way to decorate while also being practical. This blanket ladder DIY is so simple! Can you believe how much these blanket ladders cost at the store? They range anywhere from $50- $80 versus making them for under $20 at home. And if you have seen the blanket ladder pottery barn ones, well those are even more than that! That is a huge savings and considering how simple this DIY is, you can’t go wrong! Even a novice can complete this project because it is so simple and easy to do. You will be so impressed with how easy this Rustic Blanket Ladder is to make. 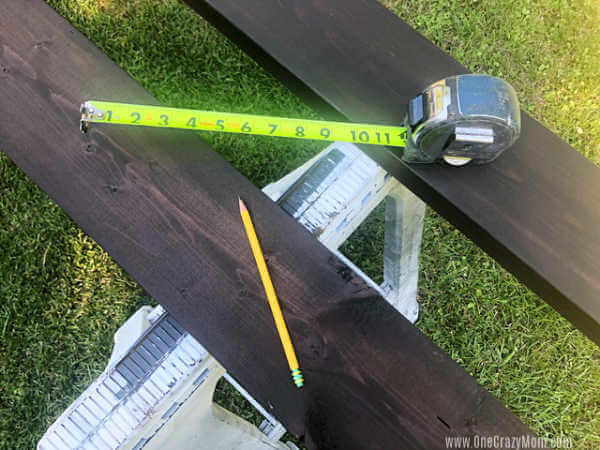 We used a dark walnut stain for our ladder but you can use what matches your home decor. This DIY blanket ladder is so pretty and perfect for any room of house. I think it would also be pretty for a nursery to display baby quilts or blankets. Not only is it a great way to organize blankets but it looks really nice as well. You might like it so much that you want one for more than one room in your house. They are so practical while being just gorgeous in your home. Please note: Always use safety precautions when using electric tools. Make sure to wear those safety goggles. 1. Set up 2 saw horses onto a flat surface. Make sure to wear your safety goggles and gloves. 2. Place two pine boards across the saw horses and carefully use your orbital sander to sand off and print or imperfections. 3. Repeat step 2 on your third line board. 4. Brush off any dust from your boards and saw horses. 5. 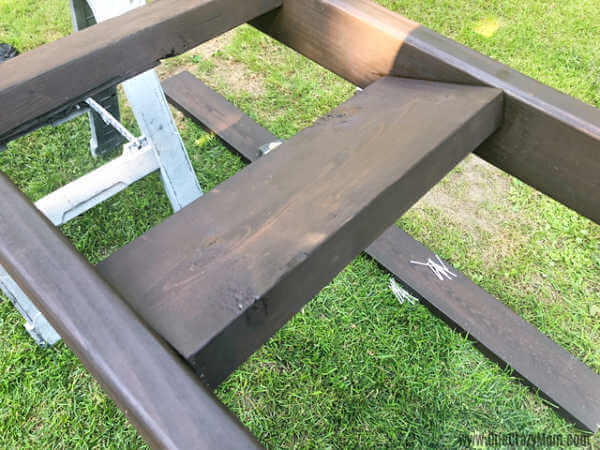 Mix your stain and use a brush to apply it evenly to one side of the boards at a time, wipe each side of the board with a rag after you brush on the stain and move on the the next side. 6. Let your boards dry outside for 12-24 hours. 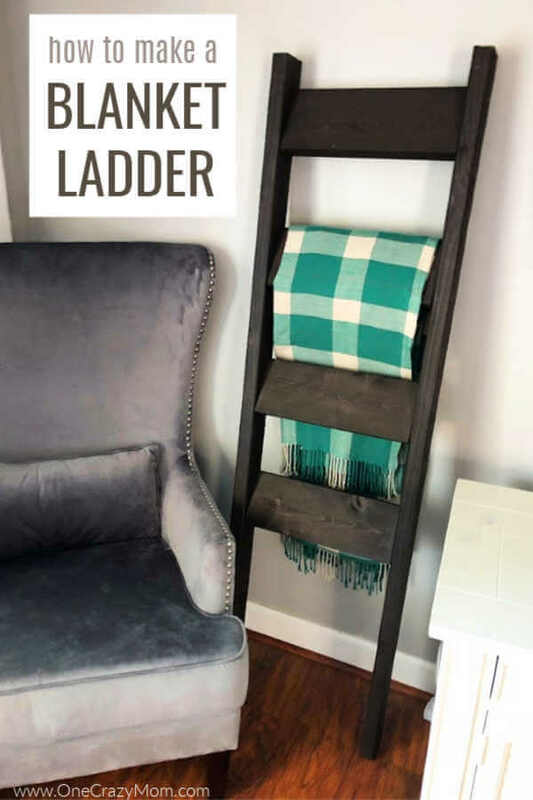 Make sure to allow drying time for this Blanket Ladder DIY! 7. Use a measuring tape and t-square to mark your cuts. 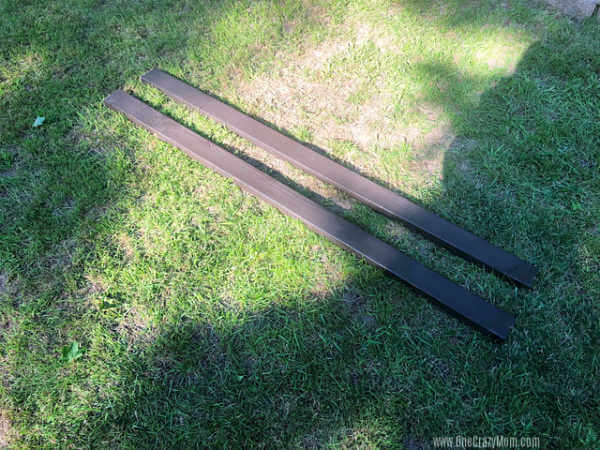 *2 x 6 x 8′ pine board- mark every 15”, you will need 4-25” pieces. *2 x 4 x 8′ pine boards- mark each board at 5 feet, you will need 2-5 ft boards. 7. 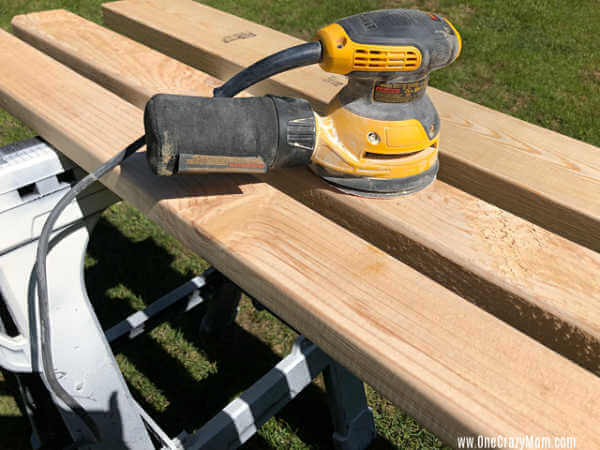 Carefully use a miter or circular saw to make a clean cut along your marked lines. 8. Sand the ends of the boards with a piece of sandpaper. 9. Measure and mark one line of each of the 5 ft boards, 3” from the top, this is where your top ladder bar will be. 10. Now measure and mark 3 more lines, 12” spaced apart from the 3” mark, this is where your other ladder bars will start. 11. 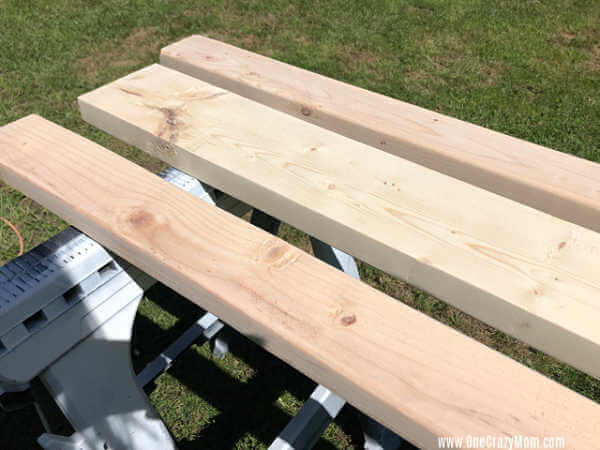 Place on 25” pine block in between the ladder sides so it is angled so that the opposite corners are flush with the opposite side of the 2×4 sides. 12. 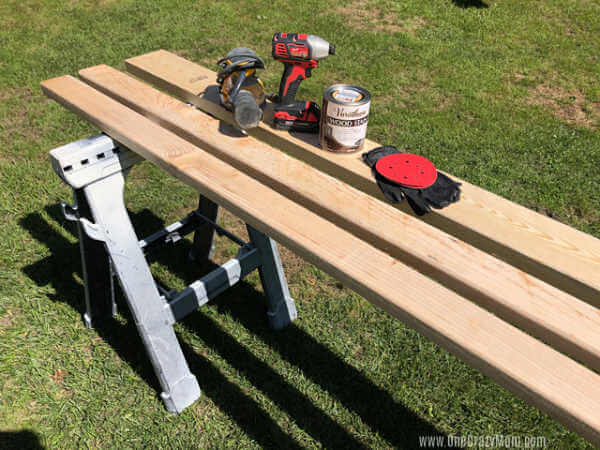 Carefully use a drill and 2 wood screws on each side to screw the 25” blocks onto the 2×4 sides. 13. Repeat steps 11 and 12 until all 4 25” boards are attached with the screws. 14. 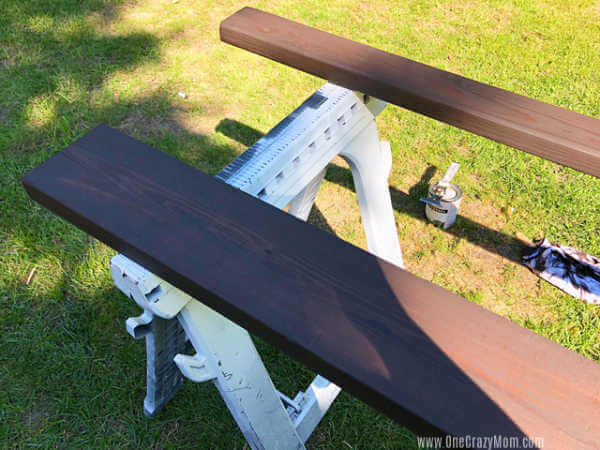 Touch up the ends of the boards with stain, wipe and let dry overnight. To skip the cutting steps, have your local hardware store make the cuts for you. All you will need to do is sand, assemble and then apply stain. 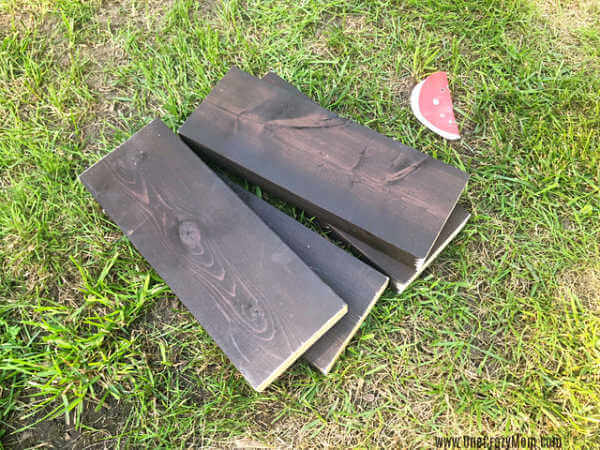 This is a great way to save a step or if you don’t have all the supplies needed to cut the boards. No worries if you do not have the saw and don’t want to purchase it, just get your local hardware store to do cut it for you. It is also a good use way to use a scrap piece of wood. You can also reinforce with wood glue. Don’t you love this blanket ladder pinterest idea? I still can’t believe that these beautiful ladders can be made for just a fraction of the cost of the ones at the store. They are gorgeous and so simple to make. This project is very easy even for a novice to do. You will love how well it turns out. Let us know how your DIY Quilt Ladder turns out. I just know you will enjoy your ladder as much as we love ours. It is perfect for any room and sure to be a hit! They are so pretty and I love that you can make them to work with any home decor. Just change up the stain to suit what works in your home. You will be so glad you made this fabulous DIY ladder. We have over 20 easy DIY Farmhouse decor ideas that are gorgeous and sure to look great in your home. These DIY Farmhouse Decor ideas are budget friendly and easy to create.